Wow! It’s HOT outside, here in the deep south! We’re still in the midst of a June heat wave, with no end in sight. Our temperature topped 100 degrees, yesterday! I’m thankful for air conditioning and I’m thankful for the Hodgepodge to keep me occupied while I’m a prisoner in my own house! Thanks to our hostess, Joyce, for this fun distraction! Lately, I’ve been taking early morning and late afternoon walks each day–until the heat recently made me retreat inside to the treadmill! During those outside walks, I’ve been admiring the trees, grass, flowers, and an occasional wild rabbit or two, so, yes, I’ve been appreciating the great outdoors. 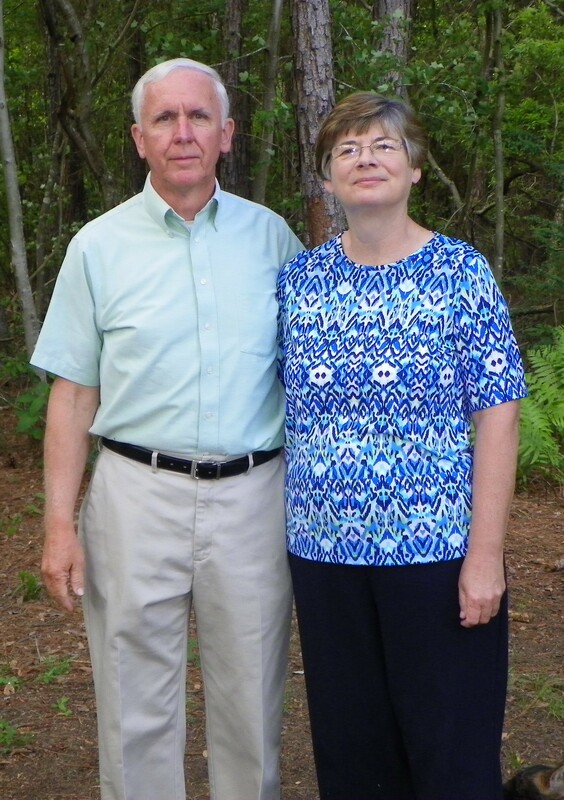 Ed and I have plans to go sit under our favorite tree on St. Simon’s Island, tomorrow, but we may decide to post pone until this heat wave passes. Even going to the beach can be miserable when temperatures are near 100 degrees! 2. What’s a current hot button issue for you? Washington and politics. I’m so disgusted with it all! 3. What’s a food or treat that ‘disappears like hotcakes’ in your house? Candy! Ed and I don’t eat much candy, these days, but our visiting grandchildren (and their parents) sure do, so I try to keep the candy dishes filled with a little something for them. Any temperature above the lower 90’s is too hot. Our temperatures have been reaching into the high 90’s (and above) since last Saturday. Enough already! We don’t usually see temperatures like these until August. I’m not sure how to answer this question, but there’s not an artistic bone in my body, so my outlook is probably not very artistic. 6. What’s one question you’d like to ask your father, or one you wish you could ask your father? My father has been deceased since 1991, so he hasn’t been around for a long, long time. If I could ask him anything, it would probably be for him to tell me more about his life growing up. He never really talked much about it, and the few things I know, I learned from mama. I learned the basics of how to cook from my father. I know this may sound strange, but, at the time, he was doing most of the cooking because he got off work before my mama did. 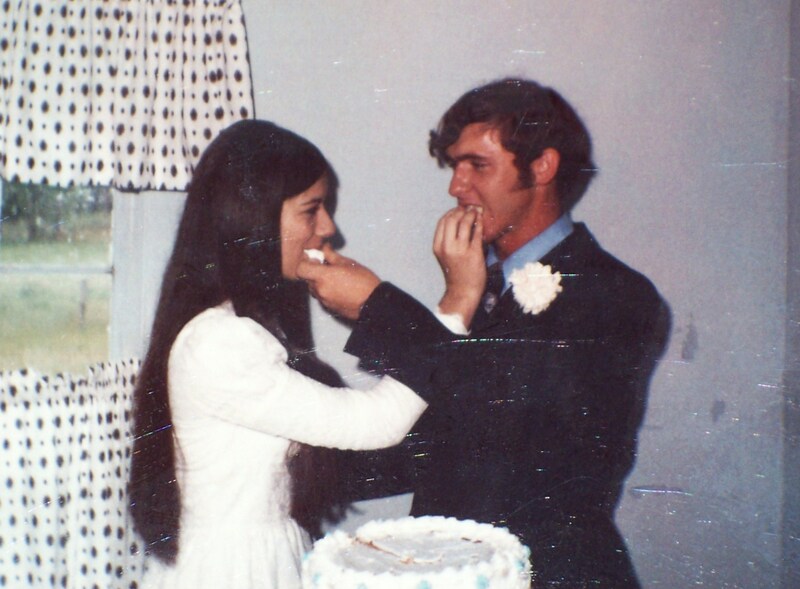 Ed and I will be celebrating 43 years of marriage tomorrow! Ah, just look at us back then! Two kids, crazy in love! We had our whole lives ahead of us… and not a worry in the world! Just look at us now! Most of our lives are behind us, and we look (and feel) like we are carrying the worries of the world, some days–but we still have each other, and we’re still crazy in love! Today I’m joining Judy at Retired-Not-Tired for Memory Monday. Today’s prompt is My Daddy. My daddy was one of seven children, six boys and only one girl. Unfortunately, one of the boys and the girl died early in life, leaving only five sons. One particular thing I remember about the five brothers is they all had nicknames while growing up. I’ve forgotten what some of the nicknames were, but one uncle was known as “Bully”, while another was known as “Bo Day”. 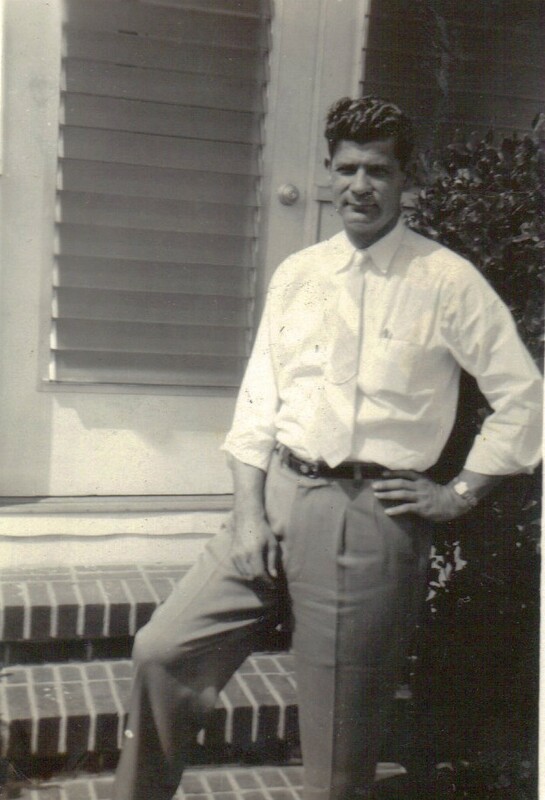 Daddy’s nickname was “Pretty Boy”, maybe because he liked to dress up and look nice. My daddy’s father gave him a pocket watch on his eighteenth birthday because daddy hadn’t tried alcohol, up to that point. Unfortunately, after his father gave him that pocket watch, daddy decided to try alcohol, a few years later. What began as ‘social drinking’, eventually became full-blown alcoholism, a problem which plagued daddy throughout his life. 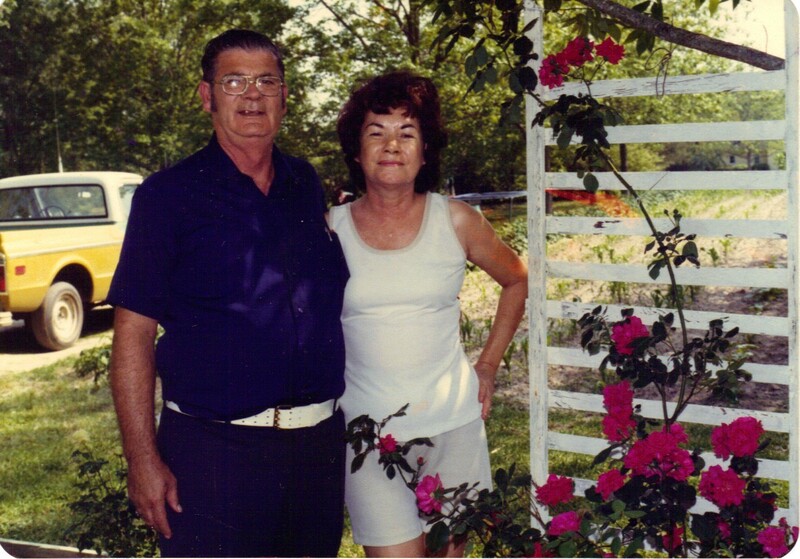 Daddy started out farming, but shortly after marrying mama, the two left country living behind, and moved to the big city of Jacksonville, Florida. Mama said she didn’t like the way daddy’s brothers took advantage of him, in the farming operation, so she encouraged him to quit, and make a new start. For a while, in Florida, daddy was a traveling salesman, but I’m not sure what he sold, ’cause that was before my time. Later, after I was born, daddy drove a Sunbeam bread truck for a living, and, years later, for a time, he even ran a gas station. In 1963, daddy and mama decided to move back to Georgia, and start over. Their drinking had landed them in a financial disaster. Once back in Georgia, daddy held several more jobs, including managing a grocery store. Now, Daddy had a ‘green thumb’ and could grow anything. 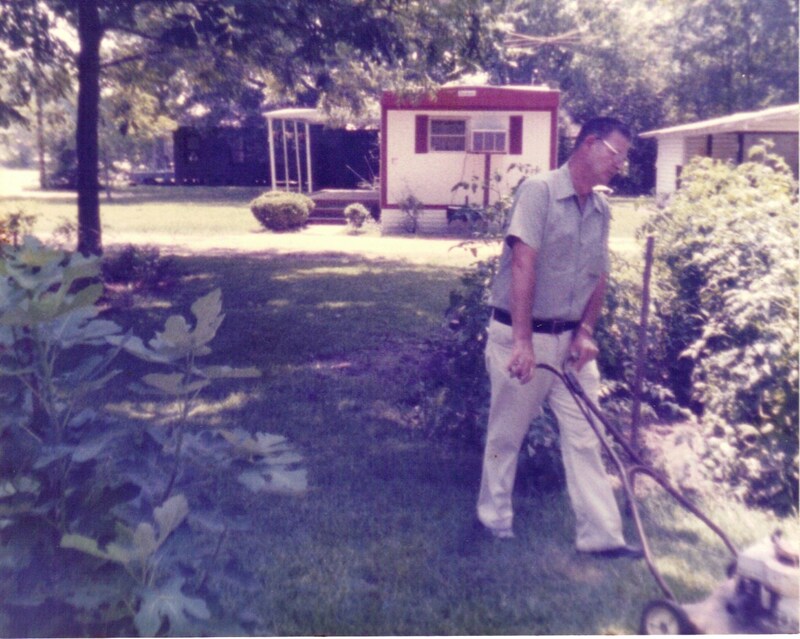 No matter where we lived, daddy usually had a small garden growing. He was able to grow enough vegetables to fill our freezer, and, often, would sell the extra vegetables to local grocery stores. The extra money often came in handy. 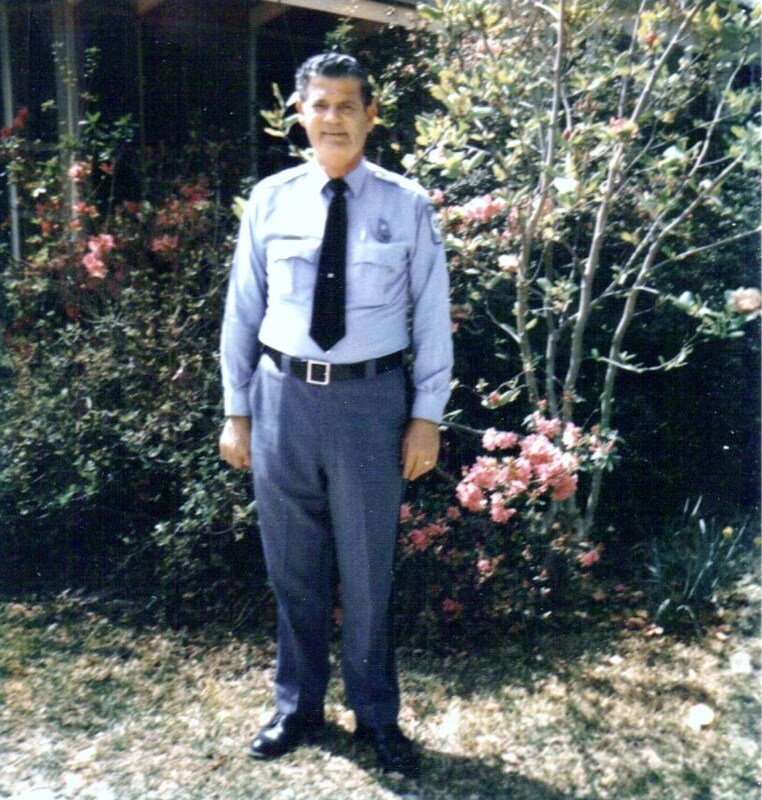 Daddy eventually became a guard at Georgia State Prison, where he worked until he retired, in 1988. Oh, the job-related stories daddy could tell! The prisoners could (and did) make weapons out of anything! A few of the prisoners were very talented, and put their talents to good use, making and selling all sorts of items. One of the most unusual items I can remember was a picture frame made entirely out of match sticks! The years passed, and mama and daddy were finally able to purchase another home. The above picture was taken in front of that second home. Mama and daddy spent fifteen years, together, in this home, before illness struck. Unfortunately, daddy’s final years on earth were tough ones. About the time he retired from working, his health began to rapidly deteriorate, at age sixty-two. First, he was diagnosed with type 2 diabetes, followed by a nearly lethal battle with pneumonia. The pneumonia was so bad, daddy stayed on a respirator, in ICU, for two months. Then, he also suffered more complications caused by the pneumonia (a blood clot of the intestines, caused by a lack of oxygen), which kept him in the hospital for a total of four long months! Daddy lost nearly one-half of his intestines to gangrene, before the doctors finally did exploratory surgery, and found the problem. Daddy spent the final two years of his life shifting between hospitals and the nursing home. He eventually died, after his long battle with illness, on May 16, 1991, about a month after he celebrated his 65th birthday. I was grateful for the extra time I had with daddy, even though much of it was spent at his bedside. Daddy and I hadn’t always been close, while I was growing up, but we developed a good relationship during those final years. Today is April 15. For many, the day will only mean the deadline for filing their income taxes. For me, it’s always meant ‘daddy’s birthday’. (Our taxes have always been filed weeks before the deadline, and, a refund is already in the bank.) 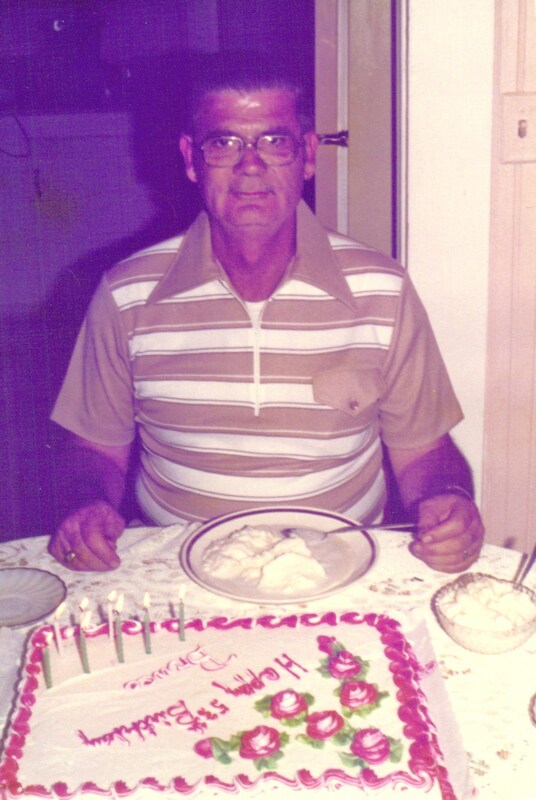 Daddy’s been gone for nearly 23 years, but I still think of his birthday, every April 15. Daddy was only sixty-five when he passed away. Back then, sixty-five seemed kind of old. These days, not so much! Our youngest son, Brad, was barely three, when daddy became ill. I doubt that Brad has many memories of daddy, at all, and I know he doesn’t have any memories of my daddy as a healthy man. Daddy spent most of the last four years of his life either in a hospital or a nursing home. Daddy was severely burned, as a child, while he was trying to build a fire in the fireplace. He was burned on his lower abdomen, and carried the scars on his belly, from age six until he died. He, also, carried many other scars on his belly, by the time he passed away. He endured several surgeries during his final years of living. He died from sepsis (blood poisoning), but he had a bad liver, and pancreatic cancer, in addition to a host of other problems. It’s only fitting since daddy loved to eat, that he also loved growing food. The man had a ‘green thumb’, and could grow anything! Daddy could grow enough food, in his little city garden, to feed an army. In fact, sometimes, he sold produce to local grocery stores! Daddy was a great cook, too. When I was a teenager, daddy did most of the cooking at our house–and he became quite good at it! 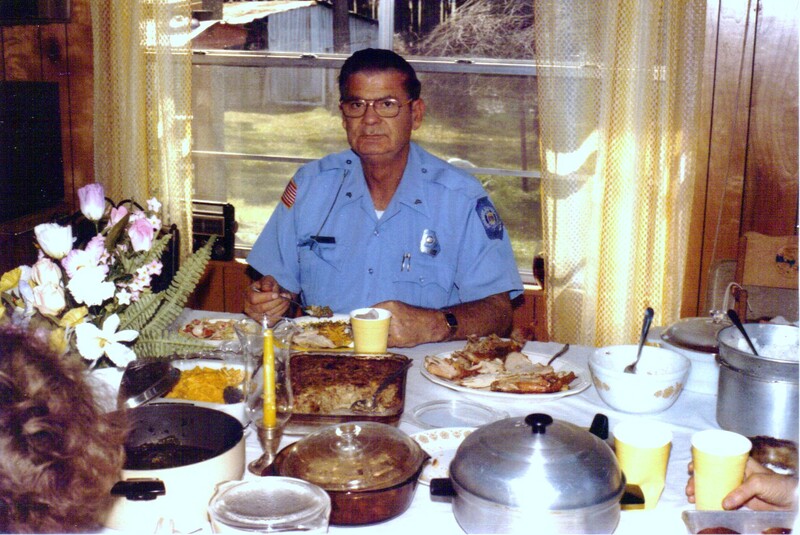 Some of his specialties were pork & rice, mustard greens, vegetable soup, and cornbread. Daddy was quite good on the grill, too. His bar-b-qued chicken was some of the best I’ve ever had. Daddy held various jobs, throughout the years. He tried his hand at farming, he was a salesman for the Sunbeam Bread Co., and he once ran a grocery store, but daddy spent the majority of his later years working as a guard at the Georgia State Prison, before he finally retired. The Georgia State Prison is the place where the original movie ‘The Longest Yard’ , starring Burt Reynolds, was filmed. Daddy worked there while the filming was taking place, and oh the stories daddy used to tell! In fact, daddy used to tell lots of stories about prison, and some would make your hair stand on end! In the photograph above, daddy is wearing his guard uniform. Speaking of the photograph above, it was taken during a birthday celebration at Ed’s parents’ house. Ed’s daddy’s birthday was exactly two weeks before my daddy’s, and, sometimes, we’d have a joint celebration, at one house or another. Looking back, I realize how blessed Ed and I were that our parents got along so well! It made life so much easier for us. These days, both of our daddies celebrate their birthdays in heaven–along with both of our mothers, who happened to both have May birthdays…but that’s a post for another day! 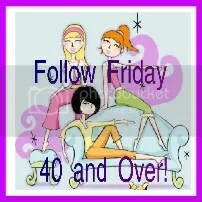 Flashback Friday…How Does Your Garden Grow? Whenever I saw Linda’s topic for today was “gardening”, I knew I had to write a post! Linda’s beginning rhyme was “Mary, Mary! Quite contrary! How does your garden grow?” My answer is–“It doesn’t!” My husband and I aren’t worth a flip at growing much of anything, but our parents loved to grow things, for as long as we can remember. Our mothers loved growing all kinds of flowers, while our daddies grew vegetables in their gardens. Ed’s dad was actually a farmer, and grew crops to sell in his younger years. Oddly enough, my parents never lived on a farm when I was growing up, but always managed to live in a house, in town, that had enough space in the backyard for a vegetable garden. Daddy always found someone with a tractor, to “harrow up” his garden, and get it ready to plant in the spring, then daddy tended the garden using a push plow the rest of the year. He always managed to grow enough vegetables to feed our family for an entire year. You could say he definitely had a green thumb, and one of the prettiest gardens around! While I was growing up, and beyond, every summer was spent picking tomatoes, all kinds of peas, butter beans, squash, green beans, and corn, then “canning” or freezing the vegetables. We shelled our peas and beans by hand. Sometimes my maternal grandmother, would come and help us shell our peas. After we got our peas and beans shelled, we blanched them, and put them in our freezer. We always put our green beans in jars, then blanched them in a large canner. We could only do seven quarts at a time though, so it was a slow process. Sometimes we did the same thing with tomatoes, but most of the time we just put our tomatoes in the freezer after stewing them down a bit, then letting them cool. I hated canning corn the most! Removing it from the cobb is such a messy job. The juice from the kernels goes everywhere while it’s being cut off the cobb, and corn juice is sticky! Mama always took some corn on the cobb, blanched it, and put it in the freezer whole. Whenever she took it out of the freezer and boiled it, the corn tasted like it had just been picked! I’ve never been able to freeze corn on the cobb like mama could! After I married my husband, our parents became good friends. Both families had vegetable gardens, and in the summer, all of us would sometimes gather and “put up” vegetables together. We’d have a great time talking and joking while getting the work done. Our parents shared their vegetables with each other, too. Those sure were some great times! Mama had a green thumb, but she used her talents to grow all kinds of plants and flowers. She had an abundance of flowers inside and out in the yard, during her younger years. Mama was always “rooting” something, as was my mother-in-law. 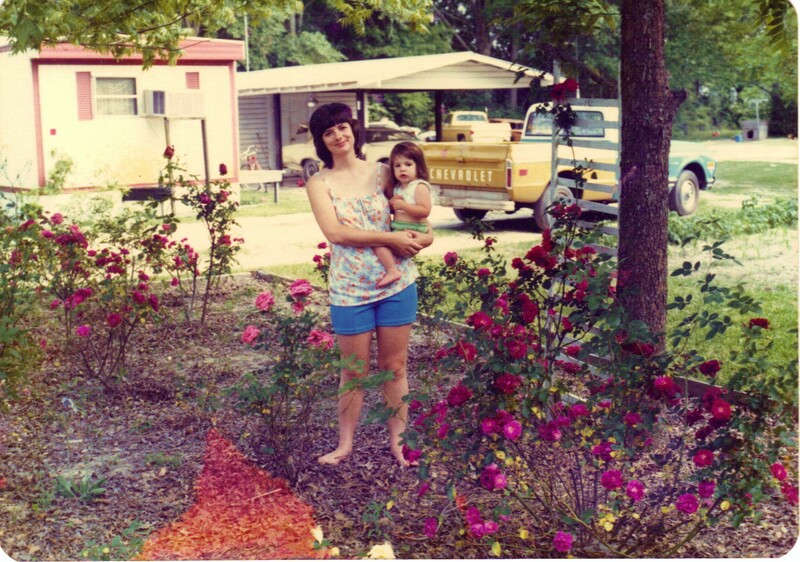 I’m sharing a photograph of me and my daughter, standing in mama and daddy’s rose garden. A couple of years ago, I ran into the woman who used to live next-door to my parents, many years ago. 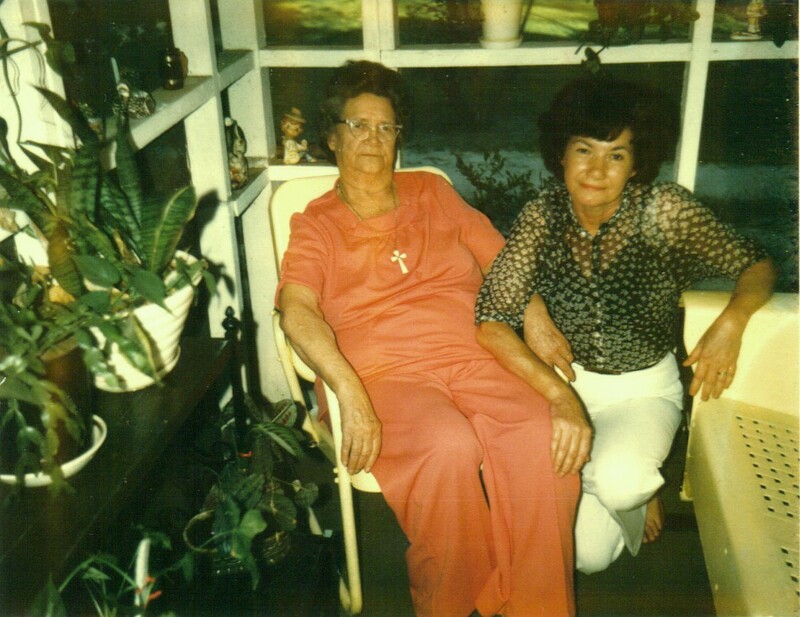 She lived in the mobile home that you see in some of the photos in this post. This woman told me how my mama had taught her how to grow plants and flowers, and how much fun she had learning from mama. It made my heart feel good to hear her say such nice things about mama, but at the same time it made me sad. You see, I never cared much for growing flowers as a young adult, so I missed out on that wealth of knowledge that my mama could have shared with me, as she had with her neighbor. To this day, I can kill a houseplant faster than you can say “boo”! My daddy’s been gone for nearly twenty years now, while mama’s been gone nearly fourteen years. How I miss those garden fresh vegetables that he used to grow! I also miss the good times we used to have out in the garden picking those peas and butter beans! My mama had a habit of disappearing into the house in the middle of the bean picking–only to return about the time we were finishing up! Speaking of the good old days, today would’ve been my daddy’s birthday. He would’ve turned 85. Today is April 15th…deadline for filing income taxes. It was also my daddy’s birthday. I always used to think April 15 would be a horrible day to have a birthday! Now I really don’t guess it is so bad, as long as you’ve filed your taxes in a timely manner. 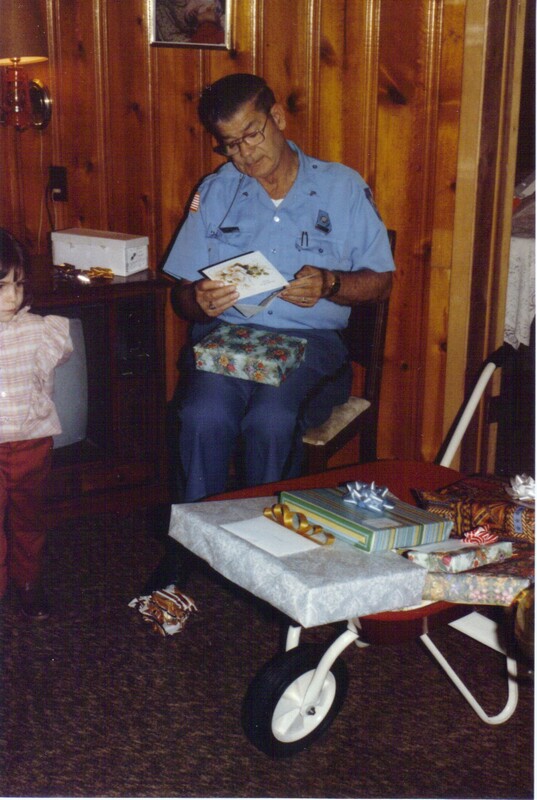 The picture above was made in 1979–the year that Easter and daddy’s birthday fell on the same day…hence the Easter basket and birthday cake on the table. 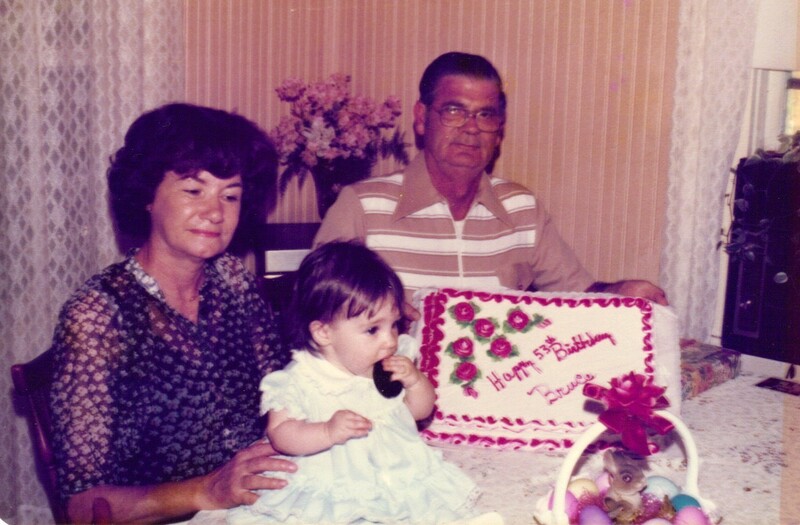 I don’t know why in the world mama bought such a big birthday cake that year, but I am sure daddy enjoyed his share of cake and ice cream! He loved to eat. This old photograph brings back memories of some good times. I tend to remember the bad times more than the good times for some reason, and I don’t know why. Maybe because the hurt and disappointment runs deep, and I have a problem with forgiveness…but I’m working on that! Daddy was a good man, he loved his family, and he had a lot of friends. Unfortunately he had a problem with prescription drugs and alcohol, and he never could gain control of those problems, despite many tries. Daddy was a Christian man, and you would find him actively involved in church during the good periods of his life. Unfortunately, most of daddy’s life was a series of ups and downs–good and bad periods. Despite daddy’s substance abuse problems, he managed to keep a roof over his family’s head, and food in the house. There were some hard times, but they made it through–thanks to the help of family and friends–and God up above. Among the trying times, were also some very good times, and I need to remember more of those times, and less of the others. One thing I can definately say about daddy–he loved mama–and let me tell you–loving mama wasn’t always easy! She had a mean streak a mile wide, and it took a special man to live with her. Now don’t misunderstand, mama wasn’t a bad person, but she could be difficult sometimes. Daddy not only lived with her, he adored her. Sometimes she made his life a living hell, but he loved her anyway. Daddy had a “green thumb” and could grow anything! He planted and grew many gardens even though he always lived in town. He could grow enough in his small garden to feed two families through the winter. Mama had a real talent with plants, and could grow beautiful flowers. Unfortunately, I did not inherit their talents, but I keep trying. My brother likes to grow things, and is much better at it than me. Daddy loved his grandchildren. I think my youngest son, Brad, was daddy’s favorite out of my three. Perhaps because daddy knew that it would be his last…Brad was just 3 years old when daddy went into the nursing home. I see so much resemblance of daddy in Brad, especially his smile. I think Brad gets some of his personality from daddy. Brad’s very social, and rarely meets a stranger. It’s hard to believe that daddy’s been gone for 19 years. It hardly seems possible. Today he would’ve been 84 years old–and that hardly seems possible either! I don’t know that I will still be here to celebrate age 84, but I sure as heck hope I make it well past 65! I’m sure it’s better where daddy is than it ever was here. Daddy endured a long illness, and geat suffering before leaving this earth. It was such a relief to see him take his last breath, and suffer no more… I believe he is celebrating his birthdays in heaven these days…with Jesus and mama.